Photograph of an arrangement of bowls, plates and pouring vessels from the Ranganatha Temple at Srirangam, from the Archaeological Survey of India Collection: Madras, 1896-98. The Ranganatha Temple is one of the largest and most sacred complexes in South India. This Vaishnava temple is situated on the holy island of Srirangam in the Cauvery River. The building of the temple started in the Chola period but most of the works were carried out from the 13th to the 17th century under the patronage of the Pandya, Hoysala, Vijayanagara and Nayaka rulers. The temple covers an area of 63 hectares divided into 7 concentric enclosures with tall gateways or gopuras in the middle of four sides. 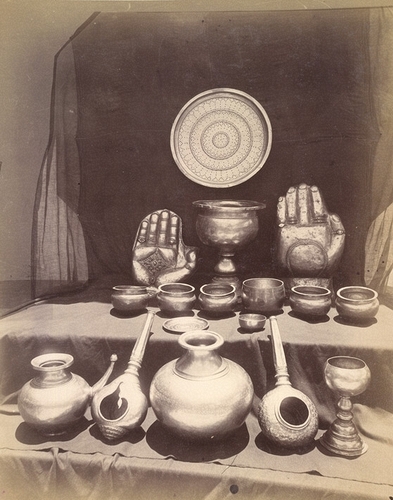 This photograph shows some of the utensils and other objects the temple received as donations from devotees. These were put on display on special occasions such as religious festivals.